The safest way to do a left turn quickly is to perform a hook turn. The diagram below illustrates how to perform a hook turn. 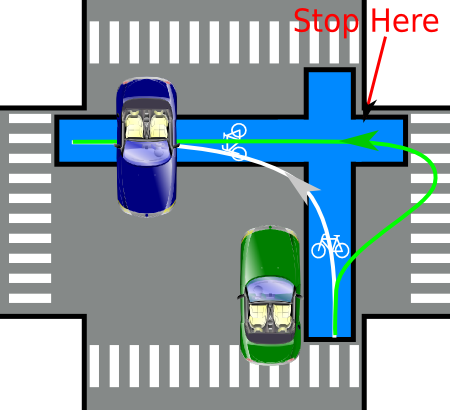 You simply signal that you are going to stop, and then turn right and then left as shown in the green path in the diagram below. Legally, you are also allowed to perform a left turn as shown in the white path, however, this is more dangerous since you will have to cross through car lanes and you must yield to the cars. So, the best thing to do is a hook turn. In case that written explanation wasn’t enough, the following video shows how to perform a hook turn. This entry was posted on Tuesday, May 4th, 2010 at 10:16 pm	and is filed under How To's. You can follow any responses to this entry through the RSS 2.0 feed. You can leave a response, or trackback from your own site.